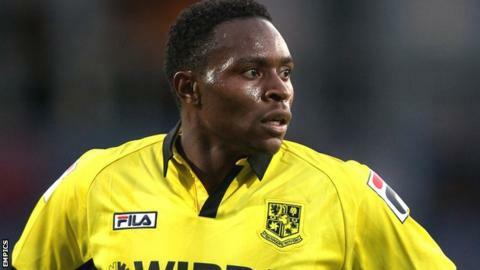 Tranmere manager Ronnie Moore has said striker Jean-Louis Akpa Akpro will be punished after being sent off in Saturday's 1-0 home defeat by Carlisle. The Frenchman was dismissed in the 36th minute for kicking out at Frank Simek. "What a stupid thing to do," Moore told BBC Radio Merseyside. "He'll be fined, there's no doubt about that. He's let everybody down today. you can't have that. We all pay for one stupid lack of professionalism." Akpa Akpro, who left Rochdale to join Tranmere on a free transfer at the start of the season, has recently returned to action following three months out with a broken bone in his foot. Rovers remained top of League One, despite suffering a and of the current top six, only Bournemouth managed to register maximum points at the weekend. Tranmere midfielder Liam Palmer added: "The other teams around us have lost, which is a good thing in a way, but we could have pulled away from them. They've got a few games in hand on us. "We've got to take something from Saturday's game (at Leyton Orient) and that's the position where we still are."